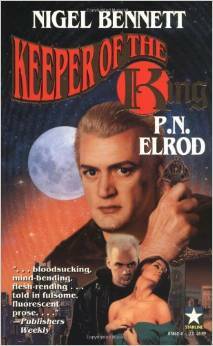 P. N. Elrod, author of the Vampire Files, the Jonathan Barrett series, and I, STRAHD, collaborated with Nigel Bennett, La Croix of FOREVER KNIGHT, on a vampire novel, KEEPER OF THE KING (1997). In the first chapter, Dark Ages knight Richard D'Orleans, a Duke's third son with no prospects in life but to win his fortune and reputation with his sword, has reached his thirties, making him an "old man" by the standards of his vocation. He falls in a tournament, defeated by a younger knight, and in his despair encounters the mysterious, seductive Lady Sabra. A priestess of the Goddess and a child of the Hound of Annwyn, Sabra chooses Richard for a unique destiny. She converts him into a vampire, appointing him the champion of Arthur, the once and future king. Richard becomes the keeper of the king and the Lady's lance of the lake (yes, he's Sir Lancelot). Chapter Two skips to present-day Toronto, where the man now called Richard Dun still serves the Crown in his own way. Working as a private security consultant, he sometimes assists the Royal Canadian Mounted Police on sensitive cases. He gets called in to investigate a professional assassin known as Charon, suspected of plotting to murder the Prime Minister. After Richard's bloody killing of one of the minor villains, he travels to visit Sabra, currently living in isolation as "great mother of the night" in the northern forests among a Native community, whose shaman knows of her and Richard's true nature. At the request of his "mother and lover," he transforms the shaman's daughter. Sabra then reveals the sad truth she has hidden from him—vampires are not literally immortal. Her own time is running out, transmutation into a beast of Annwyn foreshadowing her imminent death. Only one thing might save her, a drink from the Cauldron of Cerridwen, otherwise known as the Grail. The novel's story interweaves his quest for the Grail, the assassination plot, and a missing manuscript possessed by the man he killed and sought by a female investigator from Lloyd's of London. Naturally, the plotlines come together in the end, and the Grail proves to have surprising effects. Unlike Jonathan Barrett and Jack Fleming, Richard doesn't fall into suspended animation by day. He can walk in sunlight as long as he dresses for protection against it. He shares with them the typical vampiric gift of hypnosis and uses it to lull his victims, on whom he feeds without killing. Like Elrod's other vampires, he prefers to take blood from women at the height of passion. As a fairly well-adjusted vampire should, he has kept up with the times; benefiting from the wealth of centuries, he drives a Jaguar (he owns several, in fact). While definitely a good guy, he is far from harmless, as the outbreak of his "beast" in the killing frenzy illustrates. And although superhuman, he has weaknesses. He hates flying almost to the point of phobia, for instance. And although he can recover from injuries that would be lethal to a normal man, they hurt as much as they would have before his transformation. Richard is a strong, appealing character, who stars in one sequel, HIS FATHER'S SON (2001). He also appears—or an alternate-world version of him, not explicitly identified but recognizable to readers of the Richard Dun novels—in Elrod's new steampunk occult mystery, THE HANGED MAN. As a treat for FOREVER KNIGHT fans, the depiction of the character on the cover of THE KEEPER OF THE KING and HIS FATHER'S SON is modeled on Nigel Bennett.